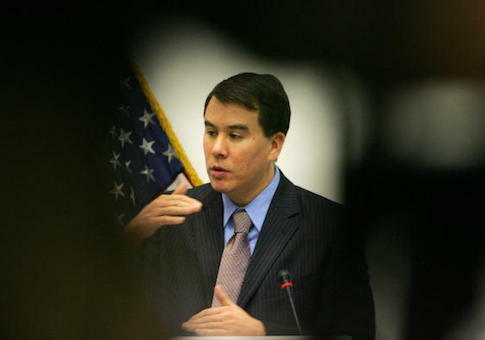 John Rood, undersecretary of defense for policy, testified before a House subcommittee that the Trump administration's new defense policy calls for conducting military and other operations in response to space attacks, mainly by China and Russia. Rood said American space systems are essential for "our prosperity, security, and way of life." "And [Defense Department] space capabilities are critical for effective deterrence, defense, and force projection capabilities," he told a hearing of the House Armed Services subcommittee on strategic forces. "Due to the critical importance of these assets, the national security strategy states, ‘any harmful interference with or attack upon critical components of our space architecture that directly affects this vital U.S. interest will be met with a deliberate response at a time, place, manner, and domain of our choosing.'" The statement on space defense was the first clear policy announcement by a senior U.S. official outlining "declaratory policy" normally reserved for strategic nuclear weapons use. Rood said the Pentagon has requested $12.5 billion in funding for the fiscal year 2019 that begins Oct. 1 for building up what he termed a "more resilient defendable space architecture." Rood, and Air Force Gen. John Hyten, commander of the Omaha-based Strategic Command, testified on the command's budget request of $24 billion. Military space "resilience" also calls for the Pentagon to rapidly replace or restore satellites after attacks or other disruptions. The Pentagon's Defense Science Board, in a report last year, warned that the vulnerability of U.S. satellites to electronic attack was "a crisis to be dealt with immediately." Satellites form the backbone of the U.S. military's ability to conduct combined arms warfare over long distances. They provide communications, navigation, intelligence and surveillance, weapons targeting, and attack warning. Hyten, the Stratcom commander, said in his prepared statement that the Pentagon and National Reconnaissance Office are implementing a "space warfighting construct." "This construct supports the national space policy and focuses on the forces, operations, and systems needed to prevail in a conflict that extends into space," he said. "Space is a warfighting domain just like the air, ground, maritime, and cyberspace domains," Hyten said. Currently, a defense and intelligence center called the National Space Defense Center, located at Schriever Air Force Base, Colorado, runs 24-hour operations for rapid detection, warning, and defense from space attacks. "New long-range, survivable, lethal, and time-sensitive strike capabilities, such as a hypersonic [conventional prompt strike] weapon, will allow the U.S. to achieve its military objectives in these environments," Hyten said. "This new weapon class prevents adversaries from exploiting time and distance and provides additional response options below the nuclear threshold." The undersecretary described China and Russia as the "central challenges" for the Pentagon in an increasingly complex military threat environment. "Both Russia and China are seeking to reshape the world order," he said. "These were the first steps down a long path in the right direction," Rogers said. "Much remains to be done here to ensure we're postured to both successfully deter a conflict in space, and if need be, prevail over any adversary if a conflict extends into space." Rogers said for space defense, the Air Force has discussed the idea of shifting from large satellites to many smaller satellites. "But what I've seen so far in the FY '19 budget isn't convincing me we're heading in that direction fast enough," he said. As part of the Pentagon's budget for nuclear modernization, two modified nuclear weapons are planned. One is a smaller warhead on submarine-launched ballistic missiles, to counter Russia's development of a new nuclear cruise missile in violation of the Intermediate-range Nuclear Force Treaty. A second smaller nuclear weapon will be a new sea-launched nuclear cruise missile designed to counter China's large arsenal of medium and intermediate-range nuclear missiles. The third base will be part of the Pentagon's forthcoming Missile Defense Review that is nearing completion. Rood said recent disclosures of new strategic nuclear capabilities by Russia were known to the Pentagon. The statements were "not surprising but disappointing," he said. As for China, Rood warned that China is "developing a very large strategic offensive nuclear force." "Both countries are pursuing hypersonic weapons and other capabilities and their behavior in the cyber realm concerns us," he said. "All of those things apiece are concerning and why in the national defense strategy we highlighted those two countries as our primary and central focus for our national security efforts going forward." Asked if the U.S. doctrine of mutual assured destruction used to deter nuclear conflict with China and Russia will endure, Hyten said: "I don't think we have to worry about that for at least a decade."